An increasingly diverse selection of restaurants is opening along the H Street Corridor, and the most recent addition offers an authentic taste of Morocco in an intimate setting. Alami Rahim’s Souk is less than a month old, and it’s already making a name for itself among the likes of Granville Moore’s, Taylor Gourmet and Sticky Rice. If you’re looking for traditional hummus or homemade baklava, Souk is worth a look. 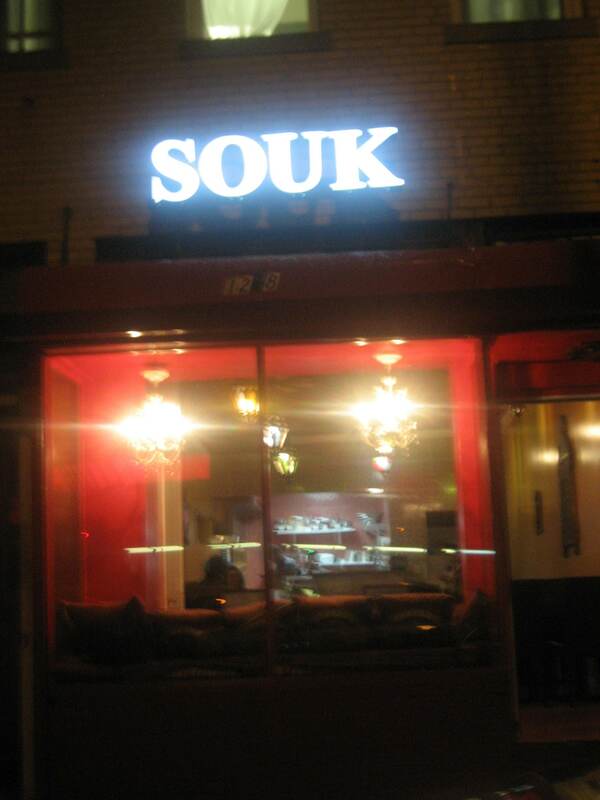 On a recent Wednesday night, we headed down the block to seek out Souk. We read some positive reviews over at FrozenTropics, but we wanted to see for ourselves. I’m a sucker for good, rich hummus (got the taste for it at Perfect Pita in Old Town), and I’ve been trying to find a place that could match that creamy consistency. A few tastes in, I could tell that I was dealing with a real contender. Sometimes the best traditions around Thanksgiving aren’t just the food, but what happens around the table once the food has been cleared away. 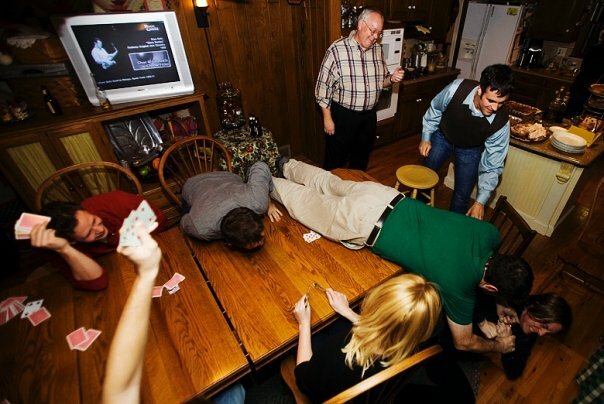 In my family, the means an insanely competitive game of Spoons among the cousins. 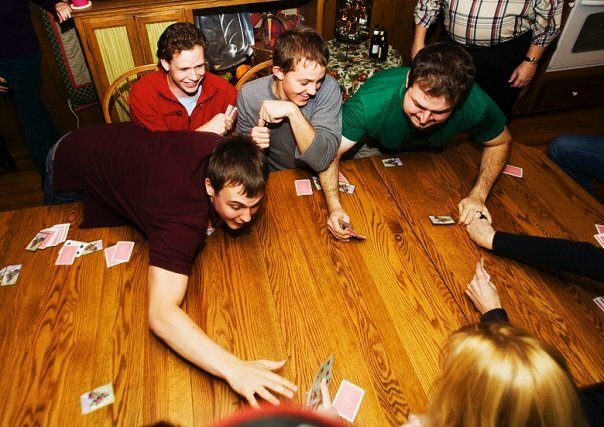 Spoons is a card game that is kind of like musical chairs. Start with one deck of cards. 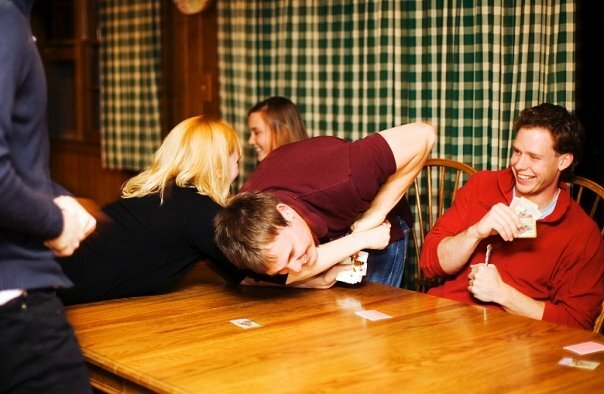 Everyone gets four cards. 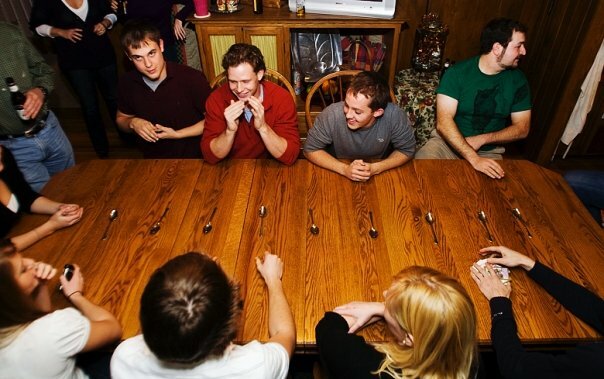 Put spoons in the middle of the table, using one less spoon that the number of people playing. Start passing cards one at a time. The first person to get four of a kind grabs the first spoon. Once the first spoon is claimed, everyone else has their chance to grab a spoon. Chaos ensues. Polite families take one and get out of the way. My family? We scatter them to the four winds. Thrown under the table, into other rooms, into the laps of competitors. Its much more fun that way. 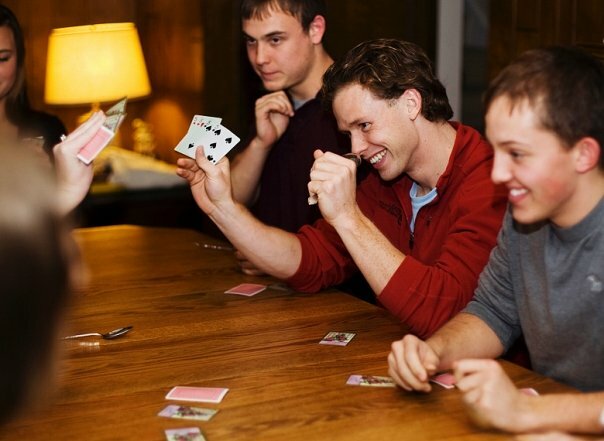 The odd person out who does not get a spoon – because you put down one less than the number of people playing – gets a letter by their name to spell out S-P-O-O-N or J-A-C-K-A-S-S or whatever you want. But teasing the loser isn’t the fun part. The fun part is watching people completely panic trying to get the last spoon. We are not above trying to steal them out of someone else’s hand. WARNING: This has led to several scars and lost feeling in my pinky for a few days. I got that damn spoon, though. Photos courtesy of Katie Barnes, my insanely talented cousin. She wisely decides to record, rather than play, Spoons. Her hands are remarkably scar-free. 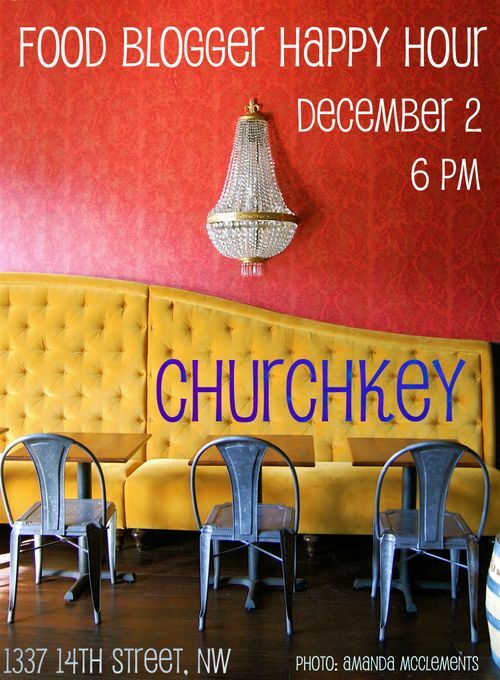 Checked Out ChurchKey Yet? Join Us Next Wednesday for Our Next DC Food Bloggers Happy Hour! With Thanksgiving just a few days away (you have started brining your turkey already, right? 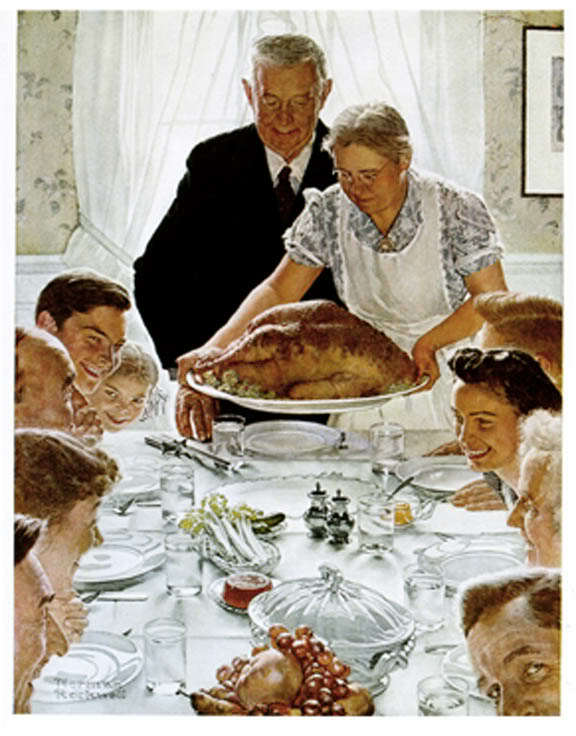 ), there’s one thing we’re not thankful for. The holiday weekend is making it difficult for us to promote the next DC Food Blogger Happy Hour. Next Wednesday, December 2nd, we’ll be gathering with dozens of our fellow DC food writers for our fourth monthly happy hour. 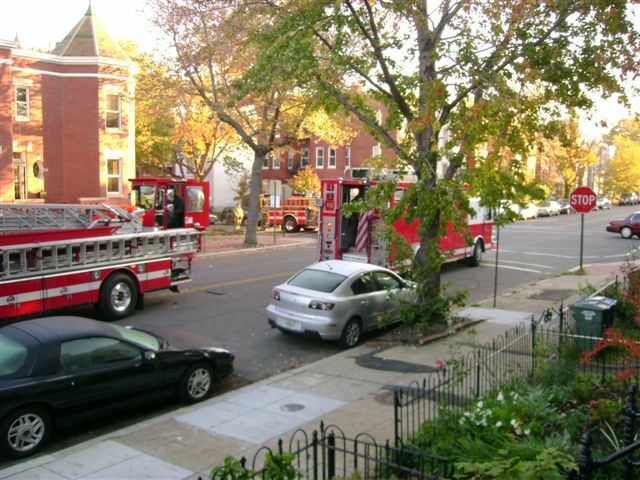 Last month, we hit the Black Squirrel in Adams Morgan. Before that, we visited CommonWealth in Columbia Heights and Poste in Penn Quarter. This month, we’re ending the year in style with a visit to the Neighborhood Restaurant Group’s newest offering, ChurchKey. Whether this will be your first visit or you’re well on your way to becoming a regular, ChurchKey (along with its conjoined twin, Birch & Barley) offers plenty of beers and other beverages for you to experience for the first time. Their food has been earning solid praise as well. Come out to 1337 14th Street, NW (near the corner of 14th and Rhode Island) next Wednesday from 6 to 8 PM and see what all the fuss is about. If you’re a food blogger – or even if you’re just thinking about starting your own blog – this is a great opportunity to meet your fellow writers and put faces to names. 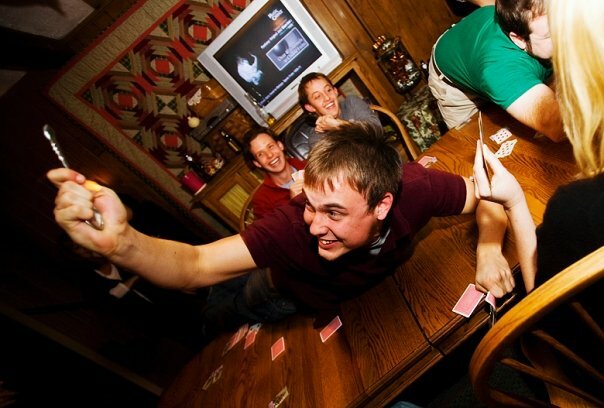 Our previous gatherings have averaged close to 50 people each; you can bet on a good crowd. This month, we’re trying to do ourselves a huge favor and consolidate the responses for the event. To that end, we’re encouraging everyone who plans to stop by to let us know in one central location: Beerspotter Orr Stuhl’s post announcing the happy hour over at the Washington City Paper’s Young & Hungry blog. If you haven’t done so already and are planning to attend, please click over there quickly and let us know so we can give the folks at ChurchKey a rough estimate of the number of people we’ll be expecting. As in the past, this monthly Food Blogger Happy Hour (I’m still calling it a FoBloHaHo until someone suggests something better) is the work of several of our friends and colleagues: Jenna from Modern Domestic, Cathy from We Love DC, Mary from The Arugula Files, Lisa from Dining in DC, Amelia from Gradually Greener, Lauren from Capital Cooking, and Orr. And a special thanks goes out this month to Amanda at Metrocurean for letting us use her photo for the flyer. We hope to see you next Wednesday. And if you’ve got ideas for locations for future FoBloHaHo’s post a note, send us an email or suggest it when you see us at ChurchKey. We’re always open to good suggestions, and we know most DC food bloggers have plenty of them! Thinking of going beyond Butterball this season? Going Green DC has a rundown of where you can purchase organic, local turkeys. For the uninitiated, a fresh turkey really is a lightyear’s worth of difference in flavor and texture. No more of that tacky meat that gets stuck in your molars. Congratulations to DC-based food writers Tim Carman, Joe Yonan, Monica Bhide, Jane Black and Todd Kliman for their inclusion of The Best Food Writing of 2009. The dairy industry is launching a new campaign to push chocolate milk in school cafeterias. UC Berkeley students assemble the world’s largest sushi roll. Repeal Day is coming! Serious cocktailers can get their tickets now for the December 5th event at PS7’s. Could Dr. Dremo’s – originally lost to the evil monster of Clarendon condo development – rise from the ashes in a new location? The Art of Manliness reviews cream sodas. 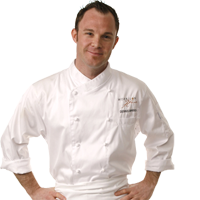 Former Microsoft technology chief takes on molecular gastronomy. The Passenger is now open for business. The Slow Cook speaks up for the value of gardens in fighting childhood obesity. Preparing a feast in a small kitchen? Take some tips from these chefs. Can the chocolate chip cookie recipe be improved? The Internet Food Association investigates. The Bitten Word tries squash bread pudding in a rum sauce. DC Foodies checks out a few brewery tours in MD. Whether you’ve decided to roast, grill, smoke or fry your turkey, the final step can make or break your presentation. Even the most beautiful bird, with a crisp and golden skin, can end up looking like a pile of hacked-up meat on the plate if you don’t carve it properly. A well-carved turkey, on the other hand, allows guests to fully appreciate the quality of your cooking. On Wednesday evening, I had the pleasure of attending the second class in Jason Tesauro’s “Modern Gentleman” series at the Morrison House. Titled “Birds & Brews,” the evening was dedicated to two subjects: craft beers and turkey dinners. While the Dogfish Head beers that Devin Arloski shared with us were delicious, the real education of the evening was a freezer-to-plate walk-through of how to brine, cook and serve a traditional Thanksgiving turkey by Chef Dennis Marron. With Chef Marron’s guidance, even a first-time carver can quickly dispatch a holiday bird. And if you think you’re the only one who doesn’t know how to do it…think again. It was a matter of moments between Marron’s honing his knife-edge and all of us gathering tightly around him to make sure we didn’t miss a step. Sometimes there’s just too much to ‘splain to contain it all in one place. Especially when it comes to Thanksgiving. 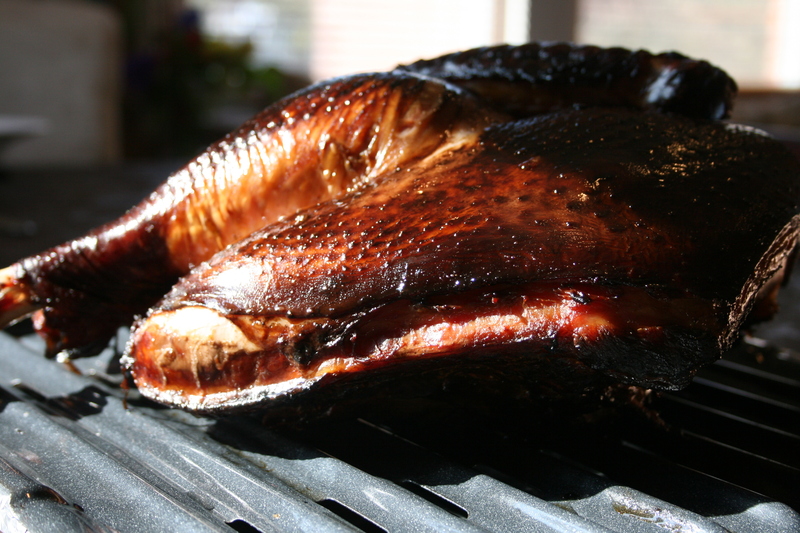 For those of you who remember our experience with a smoked turkey on “Fakesgiving” last year, check out Endless Simmer’s inaugural podcast today. Mike shares airtime with Top Chef’s Fabio Viviani, Elizabeth Karmel from Hill Country Barbecue and championship barbecuer Clint Cantwell. They’re all talking turkey and sharing different techniques to step up your Thanksgiving game. Check out the podcast and then vote for your favorite preparation style (hint: smoke it out!). If you’re pressed for time and looking for step-savers, Mike put together a list of local restaurants that can help with some (or all) of the turkey day preparations. Check it out over at DC Foodies, where Mike regularly posts the “Foodie To-Do List” of upcoming events. And keep your eye on this space for some turkey carving tips and tricks courtesy of the Morrison House’s Chef Dennis Marron. We’ll be learning from the chef at tonight’s “Modern Gentleman” program and bringing back what we learn to share it with you. 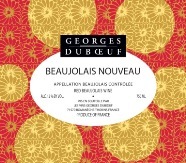 Chances are you’re well aware of Beaujolais Nouveau’s reputation as the Hallmark Holiday of the wine world. It’s an immature French red whose best quality is its ability to motivate wine snobs and more serious drinkers alike to put aside their prejudices for one night and enjoy it. That alone makes it worth celebrating. Here in Washington, you’ve got plenty of opportunities to do just that. Last year, we put together a list of Beaujolais Nouveau parties in the area and found ourselves wondering why Brasserie Les Halles hadn’t announced any plans. A week later, we learned they were officially closed. BYT Presents a Breathless Beaujolais Party @ 1905: We really can’t do this one any greater justice than to reprint their writeup in its entirety. come get Beaujolaid with us. That’s right. Ten bucks. No RSVPs. They’re also offering a $50 prix fixe menu at a 7PM seating that will guarantee you admission to what should be an amazing party. Bistrot du Coin: This one is the Beaujolais Nouveau party you’ve always heard about – with good reason. The restaurant’s dinner seatings are always fully booked weeks in advance, but as midnight approaches they pile up all the tables and chairs to make room for more guests. If the weather stays nice, do yourself a favor and get there nice and early to camp out – you may just make it in when they start letting people in. 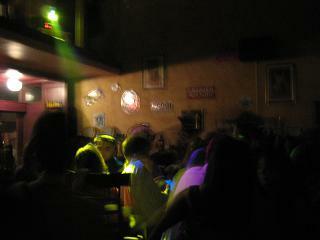 Inside, expect to be packed in with all of the other revelers. 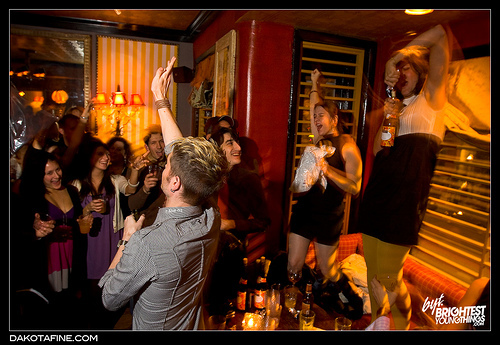 When midnight arrives, bottles start opening as fast as the servers are able and they’re passed around to a grateful crowd. It’s like Times Square on New Year’s Eve only smaller, darker and quite a bit warmer…definitely worth doing at least once while you’re in DC.